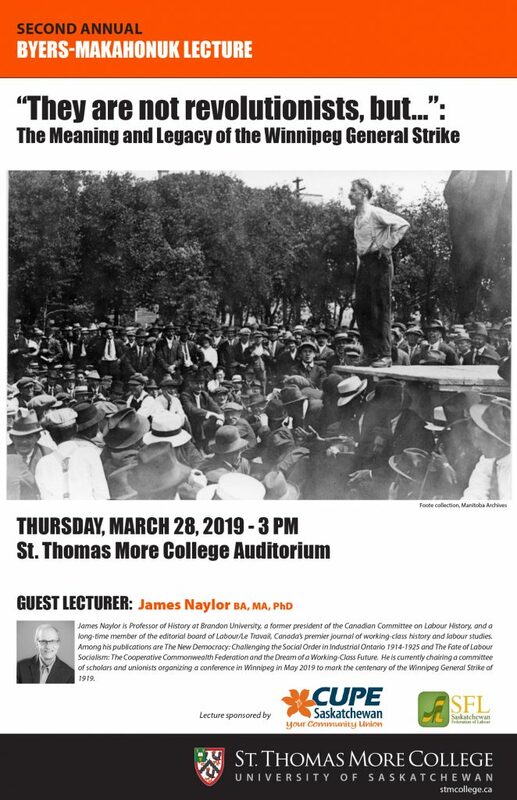 On the centennial of the Winnipeg General Strike, Professor James Naylor (Brandon University) will be discussing the legacy and lasting implications of the strike for workers and activists today. Event is open to the public and free of charge. The annual Byers-Makahonuk Labour Lecture series is a partnership with St. Thomas More College at the University of Saskatchewan and CUPE Saskatchewan devoted to promoting the role, importance and history of organized labour. The lecture series is named after two great contributors to the Saskatchewan Labour Movement. Order of Canada recipient Barbara Byers, former CLC Secretary-Treasurer (2014 – 2017) and former CLC Executive Vice-President (2002 – 2013), former President of the SFL (1988 – 2002), first female President of SGEU elected in 1984 and social worker. The late Glen Makahonuk, former President of CUPE Saskatchewan (1992 – 1997), former President of CUPE Local 1975 (University of Saskatchewan support workers) for eleven years while working as a Senior Library Assistant at the U of S, and historian of Saskatchewan Labour history with a Master’s Degree in History from the U of S.